Keeping teeth clean during braces is an important part of your oral health regimen, but keeping teeth white with braces sometimes presents a problem. Teeth whitening with braces is a common practice that orthodontic patients have done to keep their teeth white during orthodontic care. Which teeth whitening treatment you use will depend on what type of braces you have. Achieving a whiter smile is not impossible with braces, but will need extra effort and care to protect your braces. Find out how you can both whiten and straighten your teeth at the same time with these tips and tricks! Teeth whitening has been a popular choice of treatment for dental patients for years now, but orthodontic patients can now receive the same treatment, too, while getting their teeth straightened at the same time. Keeping your teeth clean while undergoing orthodontic treatment is an important step in maintaining good oral health, and teeth whitening options can enhance that process. With the variety of treatment options that orthodontic patients now have to straighten their teeth, there are plenty of ways to whiten teeth while receiving care. For patients who prefer whitening their teeth at the dental office, one option that patients can choose is “chairside bleaching.” This process requires one or two office visits in which a strong bleaching agent is applied to the teeth combined with a special light to accelerate the whitening effect and lift stains. For patients with brackets on the front of their teeth, chairside bleaching can cause a two-tone effect after traditional braces are removed, so sometimes it is best to bleach after your treatment is over. For patients with lingual braces (on the backside of teeth), though, it is relatively easy to whiten teeth during treatment since teeth whitening focuses on the front of the teeth and not the back. Removable braces and retainers also allow for successful teeth whitening as they allow all of the teeth to be uncovered. Many patients prefer at-home teeth whitening treatments over in-office treatments because it allows them the flexibility to decide when and where they whiten their teeth. For at-home treatments, gel similar to those used in dental offices will be given to you that is inserted into a customized tray which is fit to your mouth. The gel uses peroxide to bleach the tooth enamel and whiten the tooth. Even those with braces can use these custom trays after braces have been placed in the mouth. The trays have to account for the space that brackets use so the gel doesn’t displace the bracket from the tooth. With at-home treatments, though, there is a larger risk of sensitivity and gum irritation if bleaching material leaks out of the tray. Both options for teeth whitening allow patients the freedom to get the best results during their orthodontic treatment but still get the same benefits that braces offer. When deciding on which type of teeth whitening you should do, it is important to remember that the type of braces you have dictates what kind of teeth whitening you can receive. As teeth shift during orthodontic treatment, tooth sensitivity and gum irritation can increase when using mouth trays or teeth whitening strips at home. Traditional braces use brackets on the front side of the teeth to correct malocclusion while other options, like lingual braces, use brackets on the backside of teeth to straighten teeth. Whitening teeth with lingual or removable braces is much easier for patients than those with traditional braces as brackets prevent a good portion of the tooth from bleaching agents. For this reason, most orthodontists recommend using teeth whitening products once braces are removed for most effectiveness. If you do choose to use teeth whitener during treatment with traditional braces and you feel some sensitivity/tenderness, make sure to avoid whitening for a while to give your teeth a break. Chewing gum can also help with any pain you might feel from whitening agents, as well as using sensitivity toothpaste. For additional insights into what to expect when using teeth whitener with braces, meet with your orthodontist to discuss which option is best for your mouth. Many patients use everyday teeth whitening products to improve their smile rather than going to a dental office or using expensive products. As teeth whitening has become more popular, more and more products have been created to enhance smiles in the comfort of one’s home with a smaller price tag than traditional methods. For anyone, with or without braces, using a teeth whitening toothpaste is a great and easy way to whiten your smile and maintain good oral health at the same time. Even if you have sensitive teeth, there are still plenty of options for toothpaste that whiten teeth without putting your sensitive mouth at risk. There is also teeth whitening mouthwash that whitens and protects teeth from stains while freshening your breath at the same time. Switching from a manual to electric toothbrush can further whiten your teeth by polishing away surface stains that appear under braces. With all of the different dental items that can be tailored to your individual needs, you can have a whiter smile with braces in no time. For more information on how you can whiten your teeth during orthodontic treatment, call Belmar Orthodontics at (303) 225-9016! Our team is committed to helping you and your family get the healthiest and brightest smile possible! Many orthodontic patients use braces so that they can have straight teeth, but that’s not the only reason why orthodontic care is so important. Having straight teeth can minimize the likelihood of tooth decay and tooth loss while improving your bite, which affects your ability to chew and speak. Correcting crooked teeth can also improve your oral hygiene and strengthen teeth. Learn more about the positive effects that straight teeth can have on your oral health through this guide! One of the main goals of braces is to create a straight smile and correct any orthodontic issues that may prevent teeth from remaining straight. While orthodontics does focus on straightening patients’ teeth, this is not the only purpose of receiving orthodontic care. Whenever a patient has malocclusion, or bad bite, caused by crowded or crooked teeth, daily oral hygiene can become a difficult task. Malocclusion can also stem from teeth that are out of alignment, or jaws that do not meet properly. Thumb sucking or accidents to the teeth can also cause malocclusion. As oral hygiene becomes more difficult to maintain, the likelihood of dental complications, such as tooth decay, periodontal disease, and tooth loss, increases. An improper bite that goes unaddressed can negatively affect chewing and speaking, and wear down tooth enamel. Correcting these problems is of utmost importance to your orthodontist as they seek to give you the best care possible. Orthodontic care that helps straighten teeth can decrease and ultimately eliminate the chances of any of these complications from arising. With straight teeth, patients can better brush and floss their teeth, which will help strengthen them, while easily monitoring any changes that may occur. As you begin your orthodontic treatment, there are a few tips that you should know to prepare yourself for what will be expected of you during your time with braces. Although there are some challenges with straightening adult teeth versus children’s teeth due to the pliability of the jawbone, modern technology allows any adult of any age the opportunity to correct crooked teeth with remarkable success. You will first meet with an orthodontist for an evaluation and orthodontics consultation to determine what option is best for your mouth. Any oral health issues, such as gum disease, will have to be resolved before you can begin treatment. Adults have a variety of options to choose from for their orthodontic care, with many discreet options, such as ceramic or clear braces, lingual braces, and Invisalign clear removable retainers, that are available for your needs. For children, treatment is similar to that of adults and can start as early as the age of 7. Having an orthodontic examination early on can prevent the progression of orthodontic issues that are present and allow the orthodontist to monitor the development/eruption of teeth. Aesthetically-minded treatment options, such as incognito lingual braces, are available for young children who may be self-conscious about their orthodontic care. Most children and adults can expect treatment for 1-3 years, followed by a period of time in which a retainer will be used to keep teeth in their newly aligned positions. Regular dental and orthodontic visits will be necessary to track the progress of teeth and manage any plaque or tartar buildup that could accrue between teeth. Once you or your child finishes orthodontic treatment, it is important to continue certain oral health standards to maintain the health of your gums and teeth. Eating a healthy diet, with or without braces, while limiting the amount of sugary foods you consume, will prevent plaque that can stain or damage your teeth. Brushing with fluoride toothpaste and flossing each day will also prevent any plaque buildup, prevent cavities, and keep your teeth clean. Good oral hygiene is especially important for patients wearing braces because you are more susceptible to plaque buildup around brackets and underneath wires. For additional protection, consider using a mouth guard while playing any sports or activities that could damage your mouth, if hit. Creating a good oral health regimen before you start orthodontic treatment will help you have a healthy mouth during and once braces are removed. For more information on the importance of straight teeth on oral health and what you can do to get the straight teeth that you want, call Belmar Orthodontics at (303) 225-9016! If you’re ready to change your smile for the better, our team is ready to help you reach that goal for you and the rest of your family! As orthodontic technology has improved throughout the years, so have the different appliances that are used to treat children with braces. Depending on their jaw and bone structure, your child may need an orthodontic device to help guide their teeth and jaw into proper alignment. These orthodontic appliances are used to maintain space in the mouth and allow for proper tooth eruption and movement. Find out what types of appliances are available and which is best for your child’s needs through these tips! Many, if not most, dental patients will receive some form of orthodontic treatment during their lifetime. Even if one’s teeth doesn’t show any kind of orthodontic issues, it is advantageous that patients, especially children, visit with an orthodontist to maintain good oral health. The American Association of Orthodontics recommends that children have their first orthodontic visit between the ages of 7 and 8 to prevent the progression of any orthodontic issues that may already be developing. Orthodontic treatment can lead to healthy, beautiful smiles at any age, but is most beneficial when completed at an earlier age. Some benefits of visiting the orthodontist early on include observing the progress of incoming teeth, reducing the risk of impacted teeth, and monitoring facial and jaw development. Early orthodontic evaluations can discover hidden dental issues and decrease the risk for permanent teeth extractions, as well. Early detection of any dental issue is vital in maintaining good oral health for patients of all ages, and should be a goal that all children should obtain from an early age. Whenever patients think of “orthodontia,” they typically think of braces. For young patients, braces are common orthodontic appliances that they can receive to straighten their teeth and correct any dental issues. Child orthodontics includes other appliances than just braces, though, and these appliances fulfill an important function in your child’s overall treatment. 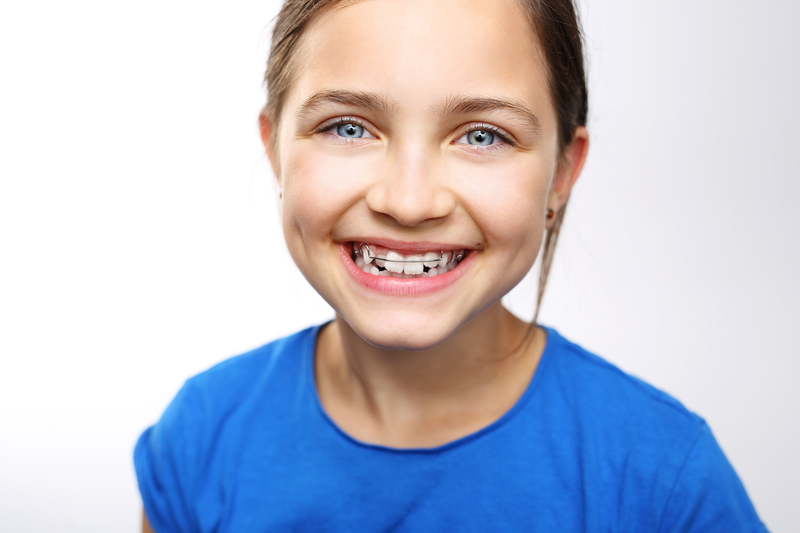 Orthodontic appliances change the way your child’s mouth works by correcting certain bone problems. Headgear, for example, guides the jaw into the proper direction by holding the upper jaw until the lower jaw can catch up with it. Retainers are other useful tools that keep teeth in the correct position after braces are removed, and most children will use some type of retainer during or after their treatment. There are other orthodontic appliances that aren’t as well known but are used quite often in child orthodontics. The Nance “Button” is one of those appliances that uses a holding arch to maintain space in the mouth for children who have lost their baby teeth and are waiting for permanent teeth to grow in. If baby teeth are lost prematurely, the first molars might move forward into an incorrect position as they erupt because there is nothing holding them back. 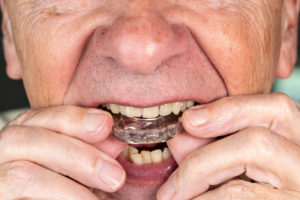 The Nance is an acrylic plate (the button) that covers a section of the palate with two metal bands around the back teeth to hold them into position until permanent teeth develop. This process helps maintain the proper space for permanent teeth to grow into. Another less-known appliance is the lower lingual holding arch, which does the same thing as the Nance but for the lower teeth. Two metal bands are cemented to the lower molars, joined by a U-shaped bar that rests behind the lower teeth. This keeps the back teeth from moving forward and maintains the space needed for future permanent teeth to erupt. Lastly, twin blocks are used to correct misalignments in the jaw that cause your child’s top teeth to stick out in front of the lower teeth further than normal. The blocks consist of two plates, one on the upper teeth and the other on the lower. These work together to bring your child’s lower jaw forward into the correct position, but is most successful when inserted while your child’s bones are still growing. They are the fastest-working appliances, and create quick results. Any of these appliances can be used in your child’s orthodontic treatment, so if you have questions about how they function or which one would be best to implement, make sure to ask your orthodontist. Most adult teeth erupt between the ages of 6 and 12, so whenever your child’s first permanent molars begin developing, the dentist will need to evaluate them to see how they work together. This process is called a “bite check,” and it helps orthodontists determine in what stage your child’s teeth are and what their treatment will require. The dentist will then decide which type of appliance would work best for your child and what instructions they will need to follow to get the best results out of their treatment. When using an orthodontic appliance, good oral hygiene will be necessary to prevent plaque buildup and other dental complications that could extend your child’s treatment time. Having your child brush and floss their teeth every day, along with cleaning whichever orthodontic appliance they’re given, will ensure that they get the healthiest and fastest treatment possible. If your child is due for an orthodontic visit, or if they’re experiencing any of the orthodontic issues that we’ve discussed, call Belmar Orthodontics at (303) 225-9016 for a consultation to improve their oral health. Our dedicated team is ready to help you create a plan for your child to get them the smile that they deserve! A gap between the teeth, called “diastema,” are common among many dental patients and can be found between any teeth in the mouth, but usually between the two upper front teeth. Why do these spaces develop, and what are the differences between a diastema in children versus adults? Diastemata develop through a variety of reasons, such as misaligned jaw bones, missing teeth, and thumb-sucking. Not all spaces can be prevented, but many can be adjusted through orthodontic treatment. If you have a diastema that you would like to have treated, learn what your treatment options are through this guide! Orthodontic treatment options have been revolutionized through modern technology and dental science. Poorly aligned teeth have been a nuisance for dental patients for hundreds of years, and orthodontic work was even performed on willing subjects dating back to the ancient Egyptians and the Romans. From crude metal bands to catgut, archaeologists have discovered that even ancient societies performed orthodontic care on patients in an effort to straighten teeth. For those suffering from malocclusion, or misalignment, a common practice for moving emerging teeth into their correct position was by regularly pushing them with the fingers, a practice that has long been outdated since the invention of custom-fit metal appliances in the 18th century. Eventually, orthodontics treatment evolved into the process that we see today: brackets being cemented to each individual tooth with a metal wire attached to cinch the teeth together. Options for invisible treatments, such as lingual braces or even Invisalign, further allow patients to choose how they straighten their teeth. While there are so many options to choose from to decide how to straighten our teeth, how our teeth first develop and erupt in our mouth is a separate process. 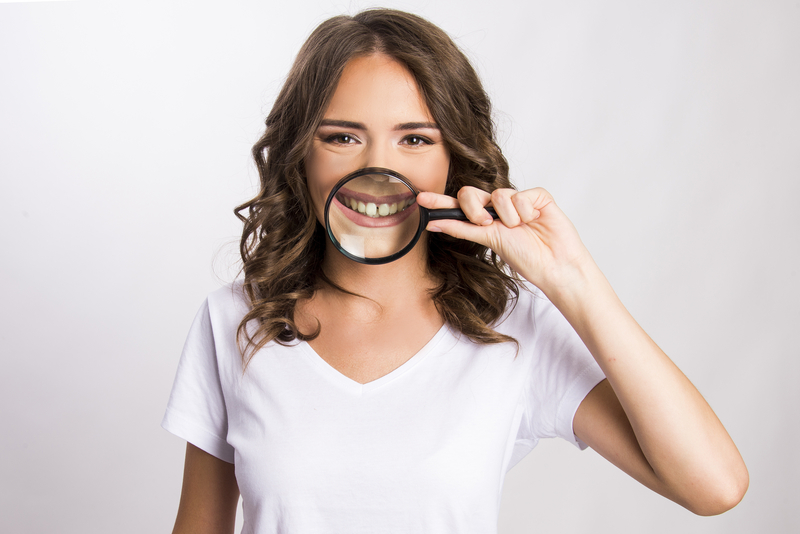 Since every patient is different and will experience a variety of dental issues, some patients may face something called “diastema,” which can have certain dental complications and be caused by a variety of reasons. Understanding how diastemata form and what you can do to fix them can give you the freedom to be in control of your oral health and appearance. Many people across the world are born with a diastema, or a gap between their teeth. These spaces can form anywhere in the mouth, but are most commonly found between the two upper front teeth. Both children and adults can have a diastema, and many times a child’s diastema will disappear once their permanent teeth grow in. While some gaps are relatively small and barely noticeable, others can be quite large and can cause cosmetic issues for some patients. While relatively harmless, most patients who fix their diastema do it for aesthetic reasons. There are a variety of reasons why a diastema develops. A mismatch between the size of the jawbone and the size of teeth that develops can cause gaps to appear, or even too small of teeth (or a missing tooth) can create spaces, as well. Sometimes a diastema can be caused by an oversized labial frenum. This part of the mouth is a piece of tissue that extends from the inside of your upper lip to the gum just above your upper front teeth. Occasionally, this will grow too much and pass between the two front teeth, causing a gap. Bad habits, such as thumb sucking, can also lead to gaps between the teeth as the movement of the thumb tends to push teeth forward, creating a gap. A diastema can also develop due to incorrect swallowing reflexes. Normally, the tongue will push against the roof of the mouth when swallowing, but some people’s tongues may push against the teeth, which causes separation. This is called a tongue thrust. Lastly, gaps can form from periodontal disease in which inflammation damages the gums and teeth, which can cause teeth to loosen and fall out, or decay. A diastema can result from a mixture of orthodontic problems, or it can develop on its own. Many people who fix the gap in their teeth do it for appearance, but for those patients who have missing teeth, they might need to have a dental implant or bridge inserted. More often than not, braces are needed to close the gap between teeth, no matter where the gap is located. Fixing a diastema affects the entire mouth structure, so braces will be installed on both the top and lower teeth for proper alignment. If your diastema is due to an oversized labial frenum, a frenectomy will be performed to help the gap close on its own. If there is any sign of gum disease, periodontal treatment will be needed first to restore gum health before any braces will be put on. Spaces will tend to stay closed when done through orthodontic or dental repair. To prevent any gaps from developing in the future, make sure to wear your retainer that you will receive after treatment and use it according to your orthodontist’s instructions. For extra protection, your orthodontist might also splint (attach) the backs of the teeth to other teeth with composite and a wire to prevent them from moving. If you notice a space between your teeth or in your child’s mouth, contact your dentist for an evaluation to determine what kind of orthodontic treatment you might need. For more information on how to fix a diastema and improve your oral health, call Belmar Orthodontics at (303) 225-9016 to start improving your smile today! Is It Too Late For Me To Get Braces? Most orthodontic patients receive their braces at a young age, typically during the teenage years. Are the teenage years the best time to receive braces, or will treatment work just as well as an adult? With the technological advances that have occurred, adult orthodontics have more options than ever to straighten smiles of all ages. Some benefits of adult orthodontics include correction of life-time dental issues, faster treatment time than former technology, and increased confidence. If you’re ready to change your smile, learn how adult orthodontics can help you through these tips! Modern advances in orthodontic treatment has revolutionized how quickly children and adults alike get the healthy and straight smiles they want, and allowed people of all ages to improve their oral health, no matter their age. For many years, traditional metal brackets were the only option to straighten teeth, but as technology has advanced, a variety of aesthetic bracket systems have been developed to give you the smile you want with braces that are less noticeable and easier to maintain. 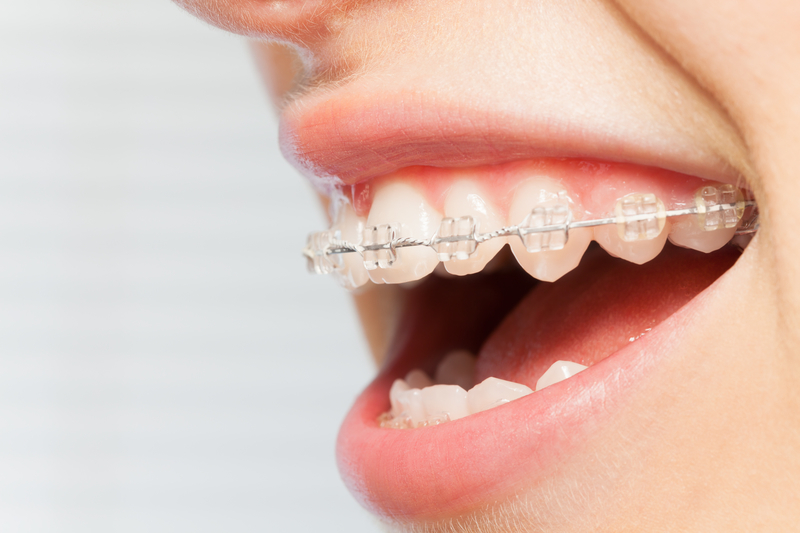 Permanent braces now come in two options: metal or ceramic. Ceramic braces are matched to teeth color, making them nearly invisible during treatment. Lingual braces are also an option, which are completely disguised from others as they are attached to the back of the teeth. Removable orthodontic appliances have recently come into play as a clear plastic aligner that is used and removed as needed. These aligners are advantageous to adults because they are less visible and easier to clean and maintain, which comes in handy for those adults busy with work and family life. As the options for braces have broadened throughout the years, so has the number of adult patients being treated for braces. Technological advances in the orthodontic industry now allows for more patients, even those who have passed the prime age for orthodontic care, to change their smiles during any part of life. Adults ultimately have more options when choosing what braces and treatment plan is best for them. Orthodontic care protects both kids and adults against tooth decay, tooth loss, gum disease, impaired speech, chewing and jaw problems. While cost is a factor, you will still need an oral evaluation and orthodontics consultation to determine your candidacy for certain procedures and treatments. For the first time, adults of any age who have otherwise healthy teeth can benefit from orthodontic treatment at any point in life. The entire process may take longer for an adult than a child. Typical treatment time averages two years, but varies from person to person. Fully-developed bones in adults have stopped growing, so some structural changes cannot be achieved without surgery. Adults may need to see a periodontist, as well as a dentist and orthodontist, to ensure that treatment will not be complicated by bone loss due to gum disease. Adults who have had teeth removed in the past might have difficulties with orthodontic care as old extraction sites might not be suitable for teeth to move into. Adult patients receiving treatment also have a higher risk for root absorption than children do as their bodies reabsorb the root of the tooth, leaving no room for anchorage. This process causes teeth to loosen and fall out over time due to gum instability. Since braces and other appliances are cemented directly to the teeth themselves, it is important that all patients, even adults, maintain good oral health practices that will prevent the areas around the brackets from developing plaque and tooth decay, which will ensure that they get the best (and healthiest) smile possible. If you are interested in adult orthodontics or are wanting to improve the look of your smile, call Belmar Orthodontics at (303) 225-9016 for a consultation to learn about which options are available for you. Our dedicated team of professionals are determined to help you get the smile that you want and improve your oral health! Surgical orthodontics is sometimes needed for those patients whose upper and lower jaws don’t align correctly and a proper bite cannot be achieved. Surgical orthodontics will change the alignment of your jaw, which will affect your teeth. Braces are normally involved in this process to correct teeth movement. Since this is a surgical process, there are many different options for patients to choose from to fix misaligned jaws. Find out whether you’re eligible for surgical orthodontics and what it can do to fix your smile! 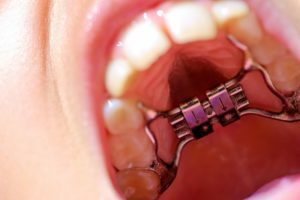 In some cases, surgical orthodontics is recommended for patients whose upper or lower jaws do not line up properly and thus cannot obtain a correct bite with orthodontics alone. Known also as jaw surgery or orthognathic surgery, this process involves correcting irregularities of the jaw bone and realigns the jaw and teeth to function together properly. Surgical orthodontics also can be used to fix aesthetic concerns about a patient’s profile or jaw shape/size. Since this type of orthodontic work involves correcting the alignment of your jaw, your teeth will most likely shift, as well, so braces are used in combination with this treatment. Those patients who suffer from problems with their chewing, breathing, or speaking due to a misaligned jaw are prime candidates for surgical orthodontics. As mentioned earlier as well, patients who have aesthetic facial concerns can also benefit from these treatments to see what improvements can be made, after consulting with their orthodontist. The downside to treatment is that it cannot be performed until a patient’s jaw is fully formed, so for children and children who struggle with any of the aforementioned issues, they must wait to fully develop before any surgery can be performed. For males, jaw growth typically finishes at age 18, and for females it is completed earlier, at around 16 years of age. Surgical orthodontics include both pre and post-surgical phases in which treatment is tailored to the individual patient’s needs and jaw structure. Pre-surgery involves aligning your teeth and moving them into a more ideal position before surgery. In many cases, braces are put on 12-18 months prior to surgery to level and align your teeth in preparation for surgery. Orthodontic surgery on your upper jaw can shift it backward, forward, upward, and downward, while surgery on the lower jaw shifts the jawbone either forward or backward. 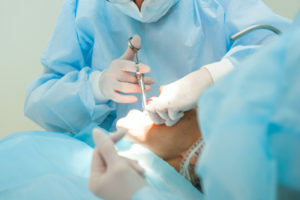 Surgery is performed by an oral surgeon on the inside of the mouth, so there are no facial scars on the mouth, chin, or other surrounding areas. The surgeon makes cuts in the jawbone, which are then moved into the correct position. Tiny bone plates, screws, wires and rubber bands are used to hold the newly aligned jawbone into their new position. While smaller than the bracket that is fixed onto a tooth with braces, these screws eventually become integrated into the bone over time. In some cases, extra bone may be added to the jaw from your hip, leg, or rib, and secured with screws and plates. During your consult with your orthodontist, you will both discuss the pre and post-surgical treatments that you will be receiving, dependent upon your needs. Typically, you will need to wait at least two weeks after surgery to resume your normal activities. Initial jaw healing occurs at around six weeks, but complete healing can take up to twelve weeks. After the one month post-operation check up, most patients will be in braces for 6-12 months after surgery, in which the orthodontist will then check the progress of your smile and alignment of the jaw. The entire process, including surgery and your time with braces, can last several years, depending on the severity of the issue and what adjustments are needed. The results of surgical orthodontics are varied and can lead to a balanced appearance of your lower face, improved function of your teeth, health benefits from improved sleeping, eating, and chewing, and improvement in speech impediments. Secondary benefits include improved self-esteem and appearance for those who seek out surgical orthodontics for aesthetic purposes. It is recommended that children visit an orthodontist between the ages of 7 to 8 for the main purpose of preventing invasive or drastic treatments later on in life. If a jaw abnormality is discovered earlier on in a child’s life, it can be evaluated and treated sooner without surgery having to be involved. If you or your child are suffering from troubled chewing, eating, breathing, or swallowing, or if you have a misaligned jaw, call Belmar Orthodontics at (303) 225-9016 for an evaluation. Our trained staff can help prepare you as you make this important step in your oral health and guide you to a healthier smile. Why use rubber bands with braces? Some people have them, and some people don’t need to use them at all. 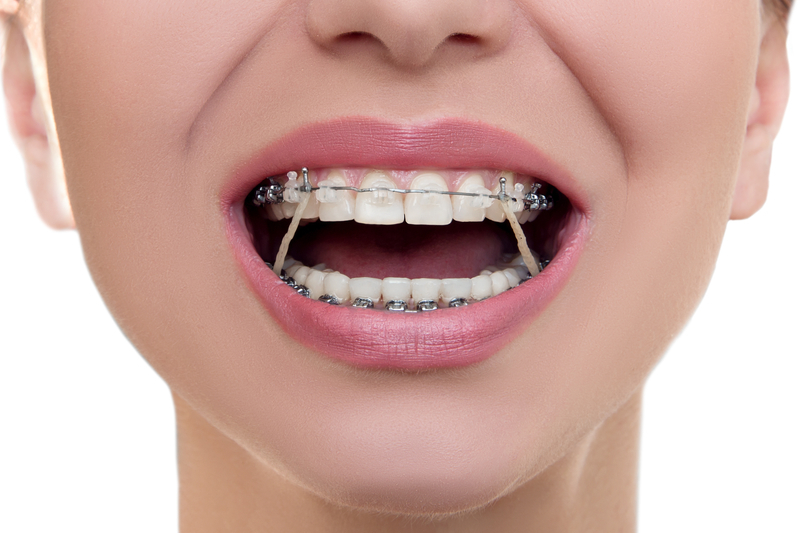 Along with brackets, archwires, and ligatures, rubber bands are just another part of braces. Rubber bands are extremely helpful as they help move the teeth and jaw into proper alignment. They are connected to the actual bracket and help improve your bite. If your jaw is misaligned, read on to discover how rubber bands might be the option to straighten your teeth and jaw at the same time! Modern technology has changed the lives, and smiles, of millions of patients worldwide who have used or currently use braces. Nowadays, braces can be as inconspicuous as we want, with some brackets being attached to the backs of teeth, rather than the front, for a more aesthetic appeal. With the invention of a variety of orthodontic appliances, such as lingual braces, Invisalign, clear braces, and traditional, the patient can decide what braces fits their oral health goals the best. 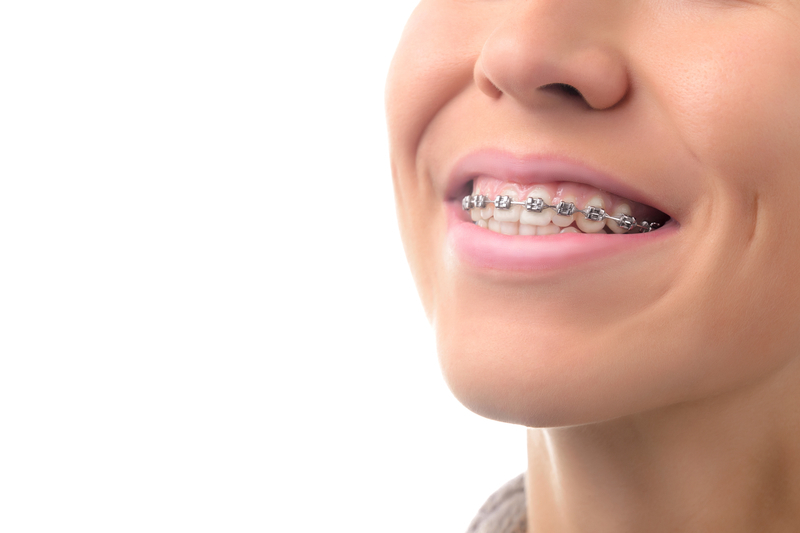 Along with the many types of braces we learn about, there are also other parts of braces that we aren’t as familiar with, such as “bracket,” “archwire,” “springs,” and “ligatures.” We have heard of the different components of braces, but what does an archwire do? How do springs help adjust our teeth? Depending on your needs, your orthodontist will install any of these appliances to help you get the best smile in the shortest amount of time possible. Brackets are the square part of the braces that are directly attached to the tooth, usually through a cement that bonds it to each individual tooth. They are usually made of steel or clear ceramic, and they guide the archwire into the appropriate placement. The archwire is held by brackets and is designed to guide the movement of the teeth during treatment. They are normally made from stainless steel, but also can be made with titanium. Springs go between brackets and around the archwire and are also made of stainless steel or titanium. They function as a force that opens or closes a space between teeth. The archwire and the bracket are connected through ligatures, which are the little rubber bands that wrap around each bracket to hold the archwire in place. For adolescents, these are usually the best part about braces because they come in a variety of colors that kids can choose from, and are changed after each orthodontic visit whenever the archwire is tightened. Although ligatures are rubber bands, they are not the same thing as interarch rubber bands, which have a major impact on jaw and bite alignment. Interarch rubber bands, commonly known as “rubber bands” or “elastics,” ensure that your child’s teeth are lining up properly. They adjust bite and jaw position, such as an overbite or underbite, and are connected to the bracket with hooks. They create a force to move the teeth in a particular direction, specifically closer together. The top and bottom tooth bracket are connected through these bands, which adjusts the position of the teeth in the mouth and the position of the jaw. These rubber bands are removed during meals as well as while cleaning your teeth and brackets. Usually, they are replaced daily because of the wear they endure and their likelihood of breaking if used for too long. When worn to adjust a misaligned bite, interarch rubber bands are typically worn at all times, except for when eating or cleaning your teeth. If the treatment is only minor, you might only have to wear the bands at night. The consistent tension on the teeth and jaw is what makes these bands effective. If a patient doesn’t wear their bands in the prescribed manner, whether it be the length of time is too short or you’re wearing more bands than normal, this can lengthen treatment time and move your teeth in an unintended way. Not every patient will have to use interarch rubber bands, but if your orthodontic prescribes you to wear them, make sure that you follow his or her directions exactly and take good care of your bands. 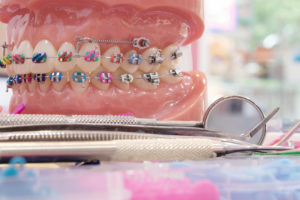 While braces have revolutionized the dental and orthodontic professions, there are some rules that a patient needs to follow to protect and get the most use out of their orthodontic appliances. Always make sure to keep your teeth clean when wearing braces. Brushing and flossing under the archwire and between the brackets is essential to remove plaque, which can easily build up on your teeth with braces. To make sure that your teeth are being cleaned entirely, replace your toothbrush every three months or as soon as the bristles are frayed. Go to all of your orthodontic appointments so that they can adjust your archwire and monitor your teeth’s movement. If you delay your adjustments, your treatment time can be increased, which can be expensive. Even though braces are strong, you can still break a bracket or an archwire with the things that you eat. Avoid foods that can get stuck in your teeth or your braces, such as nuts, popcorn, hard candy, ice, and sticky foods like chewing gum or caramel. Try not to eat as much sugary foods as it can lead to tooth decay around the brackets, which can permanently damage your teeth. Especially for active teenagers and adults, use a mouthguard during physical activity or when playing a sport to protect your mouth and jaw from getting hurt. Following this list of do’s and don’ts will increase the likelihood of having a positive and shorter experience with braces. For other tips and suggestions about orthodontic appliances and which one is best for you, call Belmar Orthodontics at (303) 225-9016 for a comprehensive exam. With our team of qualified and dedicated individuals, we will provide you or your child with the best orthodontic care for a great price. Call now to learn more! Does Your Child Really Need Braces? We typically get our braces put on during our teenage to adult years, but how do you know whether your young child should have braces or not? Child orthodontics is a common practice for those children struggling with crooked, overlapping, or overcrowded teeth, or a misaligned jaw. There are many advantages for children as they receive braces earlier on in life as it can prevent future orthodontic treatment and guide incoming teeth into the proper position. Learn how to recognize whether your child needs braces through these tips! Young kids go through a lot of physical changes during adolescence, and some of those changes include jaw and teeth development. Orthodontics has become more and more common in young children to adjust certain orthodontic issues that occasionally occur as a child develops. Traditionally, orthodontic treatment begins once a child has lost most of their baby (primary) teeth and a majority of their permanent teeth have grown in, which typically occurs between the ages of 8 and 14. Even though braces is recommended at this age, it is a good idea to get an orthodontic evaluation for your child by the time they turn 7 years old; at this age, an orthodontist is able to detect early symptoms of orthodontic problems, such as an underbite or crossbite, which can cause severe complications and more treatment later on if left untreated at an early age. Bones are still growing during this age, so it is an ideal time to meet with an orthodontist to monitor bone and jaw development while evaluating any apparent orthodontic issues. Although child orthodontics is only necessary if there are physical developmental issues within the mouth, receiving orthodontic treatment as a child has certain advantages. Visiting an orthodontist at an early age allows for observation of incoming teeth and reduces the risk of impacted teeth as your child loses their baby teeth and their permanent teeth take their place. As the orthodontist monitors your child’s teeth, they can help guide their teeth into the correct position as soon as they begin erupting, usually through braces or other orthodontic devices that help move teeth into the correct positions. Regular orthodontic visits also decrease the risk of hidden dental issues and permanent tooth extractions, as it allows for the orthodontist to adjust the jaw so that teeth crowding doesn’t occur. Child orthodontics doesn’t always imply braces. Since a child’s jaw and teeth are still growing, many orthodontic issues, such as crowding, can be addressed before complications occur later on during adolescence. In this case, orthodontic treatment in young children is known as interceptive orthodontics. Many times, a child’s dental arch may be too small to fit all of their teeth. Just a few decades ago, it was a common practice to simply remove some permanent teeth to make space in the mouth. Now, though, child orthodontics can avoid this through the use of a palatal expander that expands the child’s upper dental arch, which allows adult teeth to emerge in a better position. Interceptive orthodontics can speed up the process of aligning teeth into the proper position and cause future treatment to be shorter and less involved. Traditional metal braces – Have steel ties holding the wires between the brackets in place. Cost is driven by what your orthodontist will charge for treatment, including multiple office visits. Damon braces – Do not have steel ties, but the brackets themselves hold the wires in place. Typically more expensive and can cost up to $8,000, but you pay for less dental appointments since the braces are self-ligating. 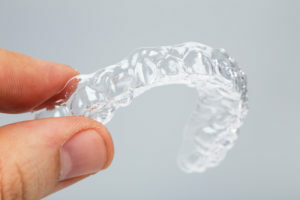 Invisalign (or other clear or removable aligners) – Fit over the child’s teeth similar to a mouthguard. Your child will receive a number of aligners during the duration of their treatment, so cost is determined by the amount of aligners needed to achieve correction. Just like adult orthodontics, child orthodontics can cost anywhere between $3,000 and $8,000, depending on what level of correction your child needs. If your child needs to have teeth extracted or be fitted for other appliances, the cost will most likely go up, as well. The way your child complies to orthodontic treatment will also affect the cost. Make sure that they are brushing and flossing everyday so as to avoid tooth decay, which will increase the cost of treatment as your dentist will have to treat around the braces to fix the decay. As mentioned before, whether your child needs braces or not at an earlier age is dependent upon their mouth structure and how their teeth form. For more information about child orthodontics or if you’re interested in scheduling a consultation, contact Belmar Orthodontics at (303) 225-9016!. Our experienced and highly trained orthodontic staff offers a variety of orthodontic treatments and technology so that you can be confident your children are receiving the best care available. Temporary Anchorage Devices: What Are They? Whenever our teeth need an extra push to shift them into a straighter position, orthodontists will typically install a temporary anchorage device, commonly known as a “TAD.” Although they’re not used in every case, they help pull, push, and lift difficult to adjust teeth into the correct position. If your orthodontist recommends that you have a TAD, read through this guide to understand how they function and what you can do to maintain them! Poorly aligned jaws and teeth have been a nuisance to mankind since the beginning of time, so it’s no surprise that orthodontics has been around for so long. Archaeologists have found human remains with crooked teeth dating back 50,000 years; interestingly enough, the remains of some ancient civilizations, like Egypt, have been found with crude metal bands around their teeth, a form of orthodontics very similar to braces that we see nowadays. The ancient Greek, the Etruscans, and the Romans also practiced orthodontia and kept records of their discoveries. The ancient Greek physician, Hippocrates, was the first to describe teeth irregularities around 400 BC, and centuries later, Celcus would advise bringing newly emerging teeth into their proper position by pushing them with your fingers. By the 1700 and 1800s, orthodontics was developing rapidly. Pierre Fauchard, the “Father of Dentistry,” would create the bandeau that allowed teeth to align correctly by using a strip of metal with regularly spaced holes that fit around the teeth. During the 20th century, Edward Hartley Angle would identify the true properties of a malocclusion, or misalignment, and begin addressing them with an effective set of orthodontic appliances that were developed much earlier. By the 1970s, braces would further advance through the invention of dental adhesives that would allow orthodontists to stick brackets to teeth surfaces rather than wiring them around each tooth. Stainless steel replaced gold and silver that were previously used as the wire, which helped reduce the cost of braces significantly. Even with the impressive advances that we have made since the beginning of orthodontics, patients around the world still suffer from advanced teeth and jaw malocclusion that normal braces can’t resolve on their own. For the purpose of increasing the effectiveness of braces, other orthodontic devices have been invented to facilitate this process. Whenever we think of “orthodontics,” we innately assume braces. Braces have two basic parts: brackets and wires. Wires move the teeth and brackets serve as a stationary holder for the wires. 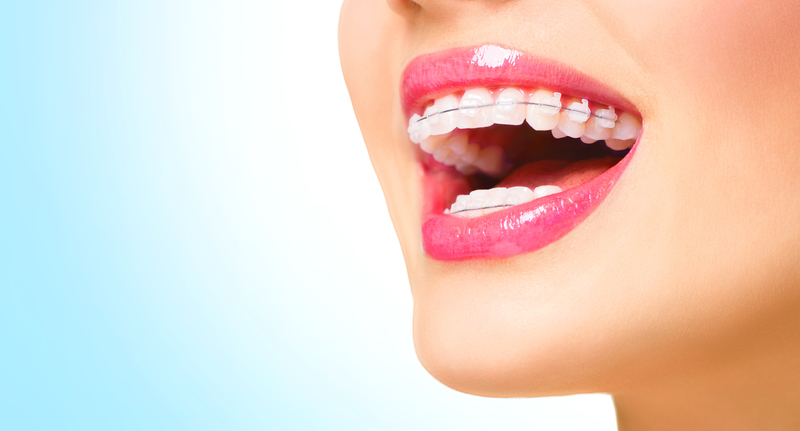 Contemporary braces can be stainless steel, gold-colored, or tooth-colored ceramic. Most braces go on the front of the teeth, but there are some, called lingual braces, that are fastened onto the backs of teeth that are virtually invisible. Lingual braces are not the same as clear aligners, which is another orthodontic device. 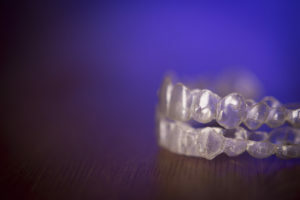 Clear aligners are made of a transparent plastic-like material and are considered “invisible braces.” They are made to fit the patient’s teeth at different stages of treatment. Each set of aligners is worn for 1-3 weeks for at least 22 hours a day, and are designed to move the teeth incrementally until the next set is used. 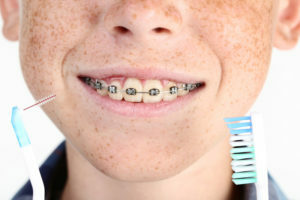 While these types of braces are a very common sight to see in many homes, schools, and workplaces, they aren’t the only devices used to move teeth and align jaws. Power chains are sometimes used with braces for an added push. They are stronger than the traditional elastic rings and can apply an extra force when needed. The last orthodontic device that is commonly used, although many patients don’t know what their purpose is, is a temporary anchorage device, or TAD. Temporary anchorage devices, most commonly known as TADs, are used in some orthodontic cases to help shift the teeth into a straighter position when traditional braces can’t do it on their own. For this reason, not everyone needs them. TADS use titanium mini-screws (sometimes called mini-implants or micro-implants) that provide a fixed object that can be used to push, pull, lift, or intrude teeth that are being straightened. TADS don’t move and can be placed in many different parts of the mouth, so they are highly efficient at moving difficult teeth back into proper alignment. Before TADs are ever inserted into your mouth, though, your orthodontist will evaluate your teeth and determine whether your malocclusion is severe enough to receive a TAD. Before insertion, your gum tissue and jaw area will be numbed so that the procedure will be nearly painless. The TAD is then placed into your jawbone, and will eventually be removed once your orthodontist feels that it is no longer needed for straightening your teeth. Just like braces, it may take a couple of days for the discomfort to subside and your mouth to get used to the TAD. Try taking an over-the-counter pain relief medication to alleviate any excessive discomfort. An important part of maintaining your TAD is continuing your oral hygiene regimen. Continue to brush your teeth at least twice a day and use mouthwash with antimicrobial ingredients. As long as your gums are healthy throughout the duration of your treatment, you shouldn’t have any complications with your TAD. To learn more about TADS, or to schedule an appointment to begin your treatment plan for braces, call Belmar Orthodontics at (303) 225-9016! At Belmar Orthodontics, we have a highly skilled and experienced team that is happy to help you start your journey to a healthier and happier smile.